Do you have any idea how true this is? It constantly blows me away. Sitting around on the front porch, drinking sweet tea, and flipping back and forth from having discussions about serious things like God's will and how it works in our life to silly conversations where we laugh our heads off....ordinary? Yes. 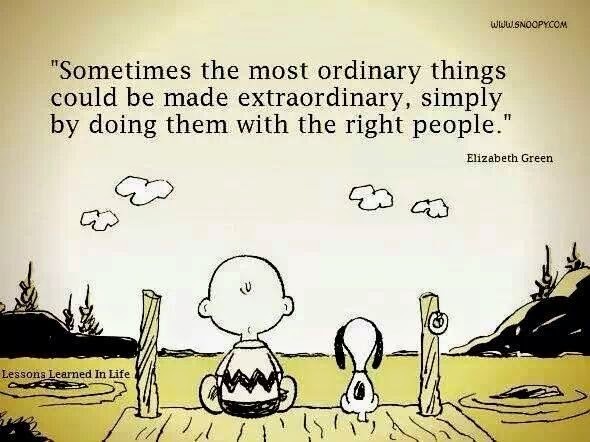 But with special people....extraordinary. Moving hay, singing songs, working, playing, laughing, crying - all these things that we do on an everyday basis....how wonderful to do them with other people who are fun, encouraging, thoughtful, and trying to live for Christ. God has blessed me SO MUCH with the amazing people He has placed in my life. I am so thankful for all of you. Each one of you has been an incredible encouragement to me, and I love you guys so much!! I totally agree. Our family's really haven't done that much, but doing it together makes it so much more than just putting up fences or moving bird cages. I totally love this, and find it so true! Who I'm with means so much more to me than where I am or what I'm doing. Good friendships are such a special blessing from God. Beautiful Post! You have been given a precious gift, treasure it. I love what Bushmaid commented "see God's goodness in an ordinary moment made extraordinary by the people you're with; I sit back and see it through blessed eyes, and simply think - "this is God".